Biotechnology is at the heart of heated debates about ethics, safety, economic development, and about the control over the biological materials and technologies used. The latter, grossly called biodiversity issues relating to the application of intellectual property, has been the subject of a wealth of literature. Yet, the situation of animal genetic resources specifically has only marginally been addressed so far. Many books and articles address ‘biotechnology and agriculture’, but have only plants and seeds in mind. Case-law and specific regulation is equally scarce. Exacerbated by the so-called ‘erosion of animal genetic resources’, climate change, the globalization of the market-place, and a strong concentration of markets, animal genetic resources however demand specific analysis and adjustments in intellectual property law. The decoupling of rights over animal genetic resources as an abstract concept, from those over the concrete animals is a fact today. The application of patents in this context became a full-fledged part of the management of animal genetic resources. With detailed investigation of how three major jurisdictions – the European Union, the United States, and Canada – have regulated the matter, the book highlights unresolved issues in the laws dealing with animal genetic resources. How do the usual principles of patent law affect ownership over animals in agriculture? To what extent is patent law in accordance with neighbouring fields of regulation, with relation to animal welfare? How can intellectual property be used to alter, stimulate, or tackle developments in the realm of the conservation and promotion of biodiversity? Questions like these are asked, checked upon the more technical country studies; and then used to put to test the adequacy of international patent regulation in a final chapter. As a deeply informed overview of the arguments and discussion points, this is the only book of its kind. 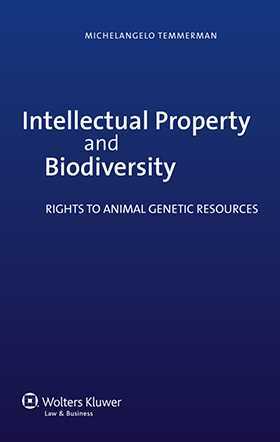 It links general discussions to the often technical and complicated patent regulations, in the specific context of animal genetic resources. It is sure to bring lawyers in the field closer to the policy debates; and decision makers closer to the precise idiosyncrasies of patent law. Acknowledgments. List of Abbreviations. Introduction. Chapter 1 Rights to AnGR. Chapter 2 Patenting AnGR: A Comparison between the United States, Europe and Canada. Chapter 3 Patenting AnGR: Impact on Ownership Traditions in Agriculture. Chapter 4 Patenting AnGR: Issues of Animal Welfare. Chapter 5 AnGR, Intellectual Property and Biodiversity: The Positive Angle. Chapter 6 Patenting AnGR Animal Genetic Resources and International Regulation. Concluding Remarks. Glossary. Bibliography. Table of Cases. Table of Legislation. Index.